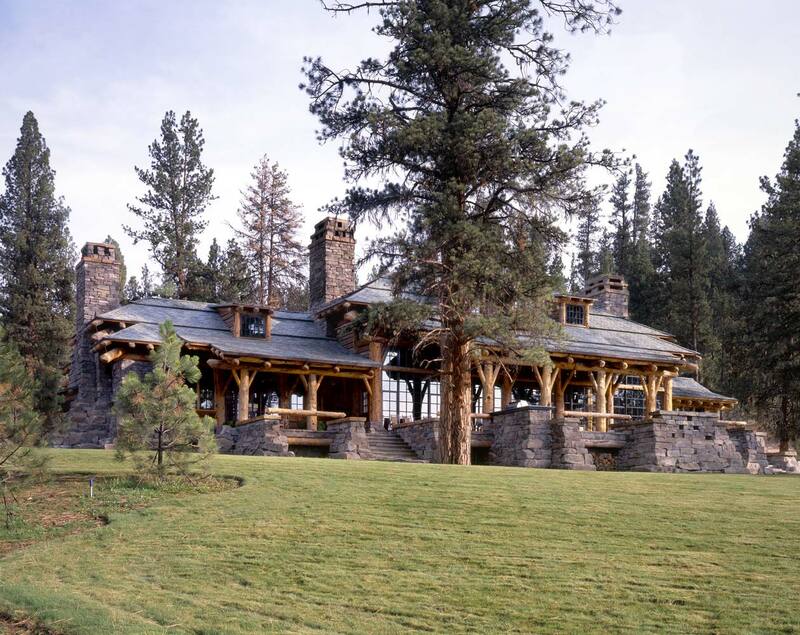 SITE: This project is located in French Valley, Montana. 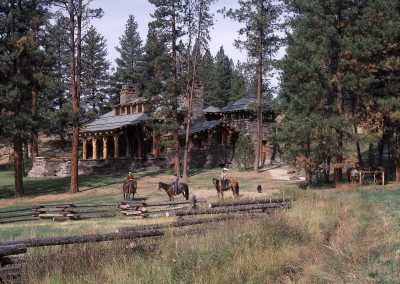 Elk, moose, deer and black bears roam freely on this 4,500-acre ranch, covered by dense pine groves and grass zones with streams and a lake. 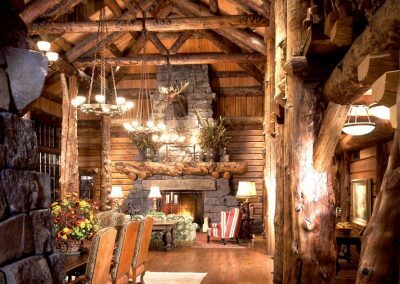 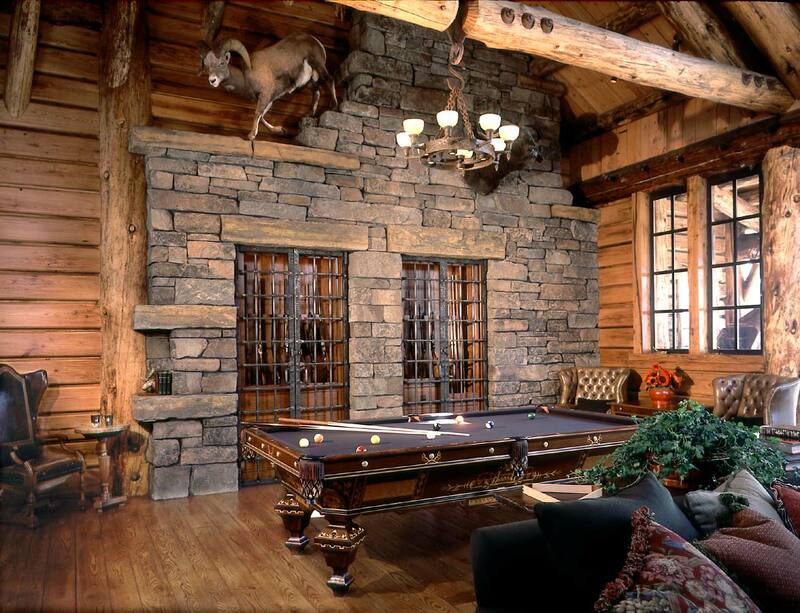 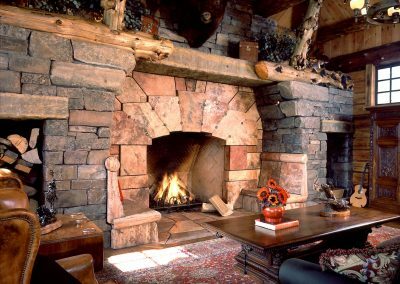 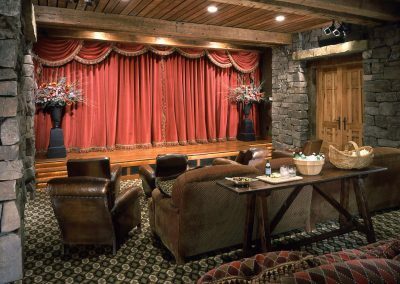 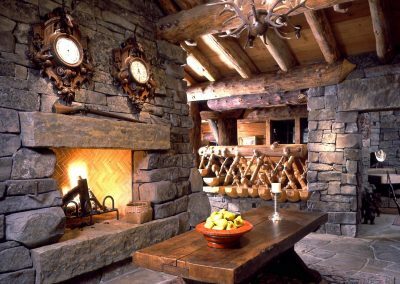 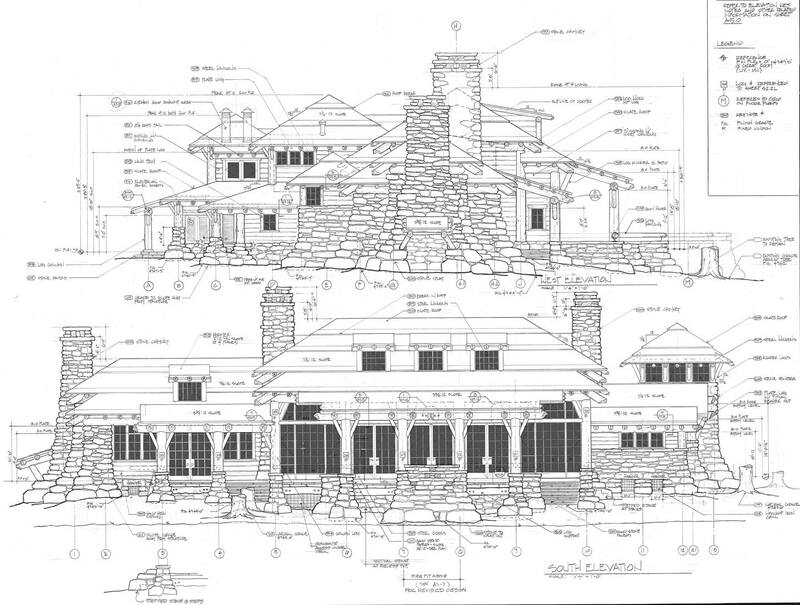 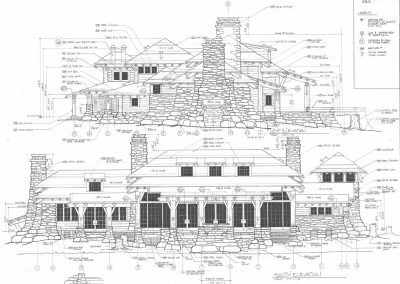 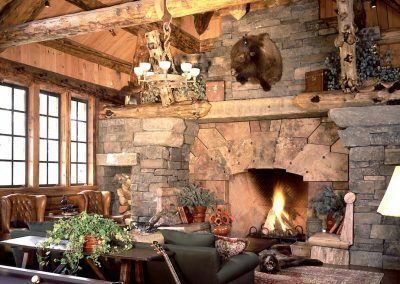 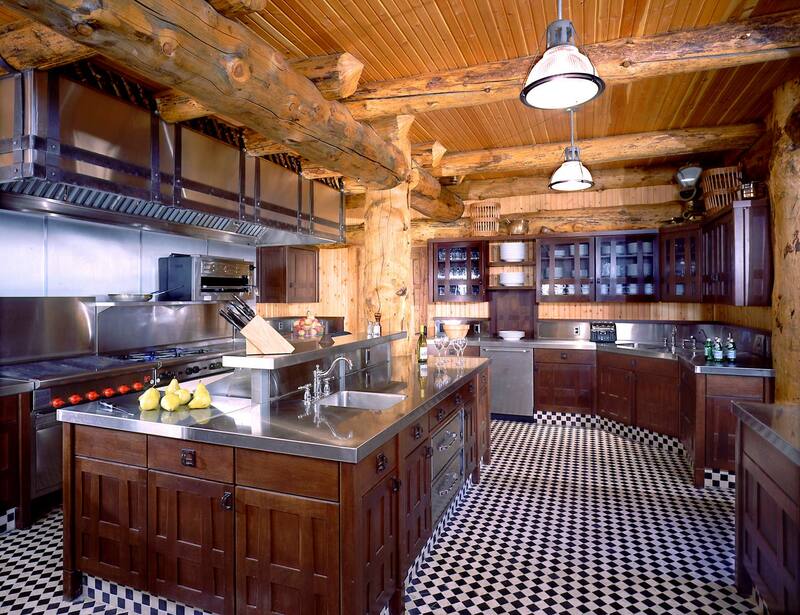 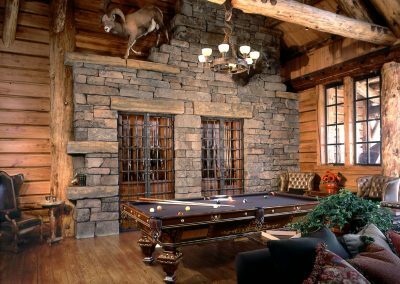 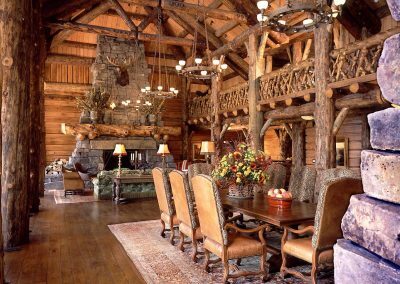 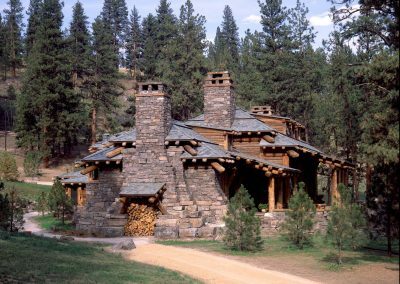 The Lodge is a serious architectural building type utilizing one of man’s oldest natural building materials. 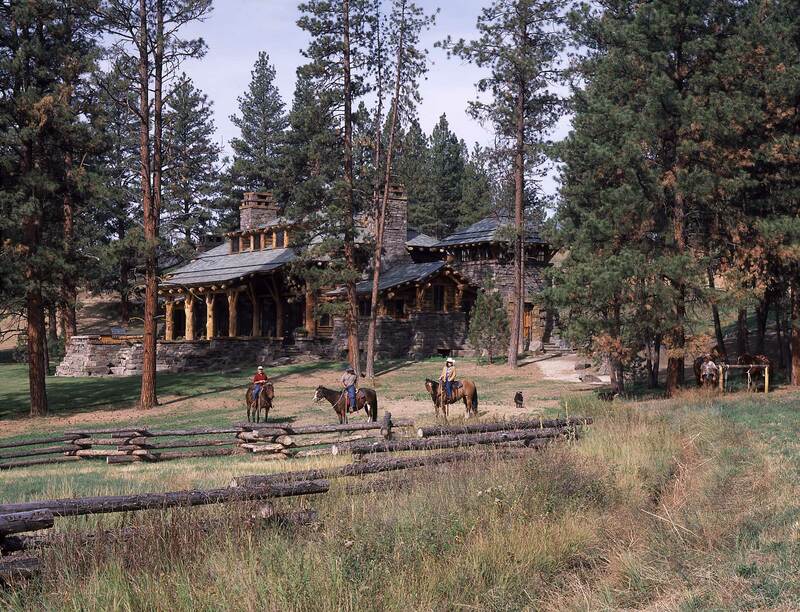 PROGRAM: The proposed project included a recreational working cattle ranch with a master development plan, entertainment and meeting lodge, a dozen guest cabins, a working ranch center, riding and fishing facilities, ranch house, and an all season recreational village. 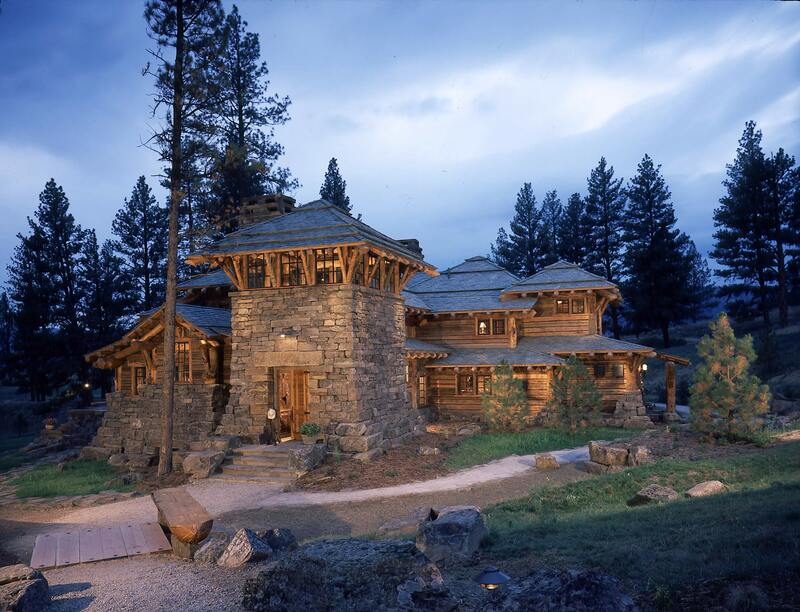 First phase construction included a Post & Beam lodge and four guest cabins. 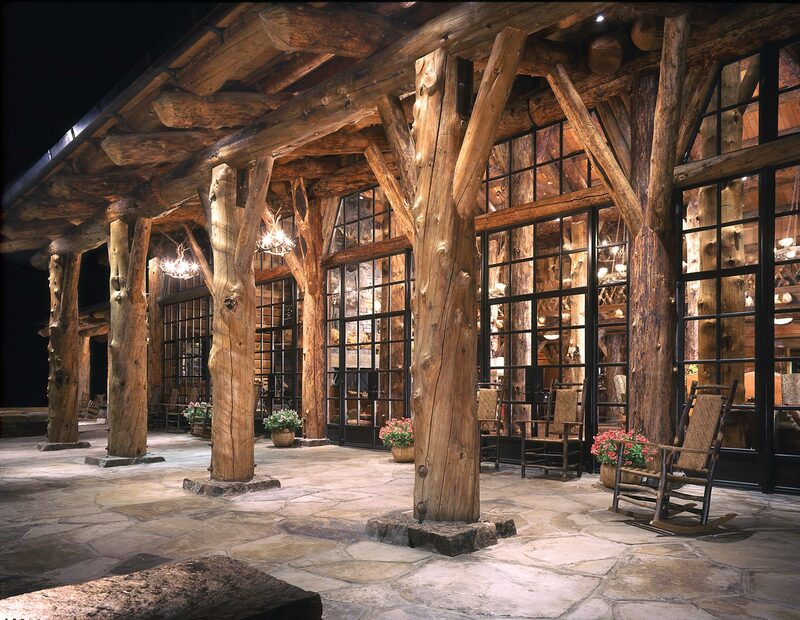 The project will be managed as a first class ranch retreat for families and groups. 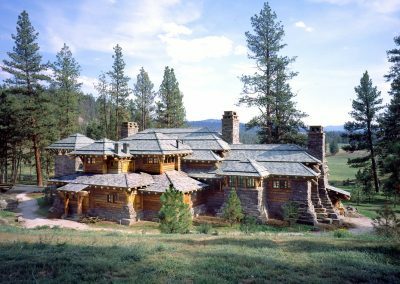 DESIGN SOLUTION: Without removing trees, the building was sited in a natural swale in a pine tree grove. 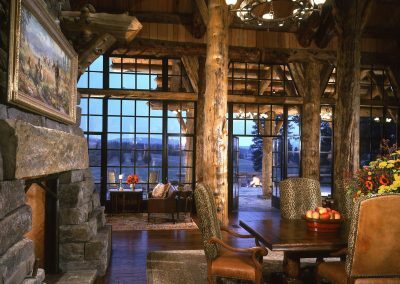 The design inspiration for this dining and leisure guest lodge comes from a Japanese aesthetic where larger building materials are used at the base and taper towards the roof. 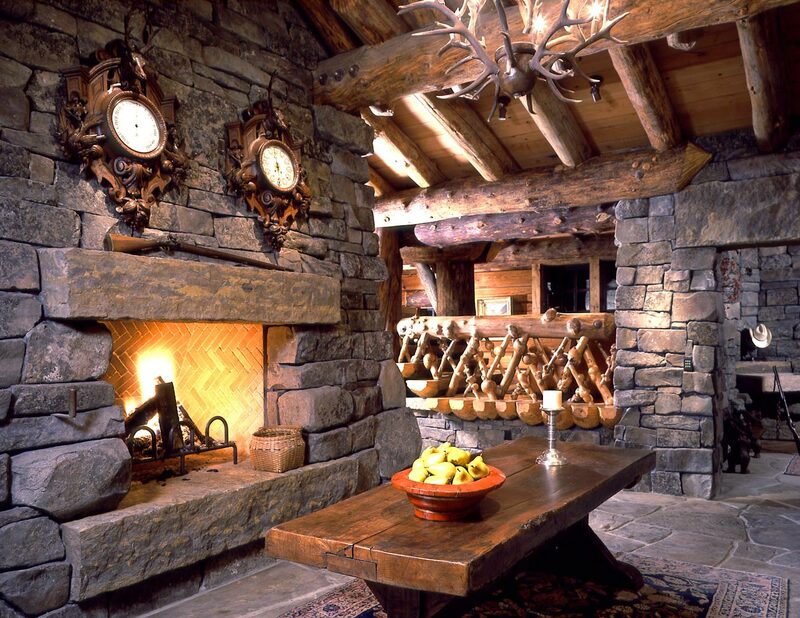 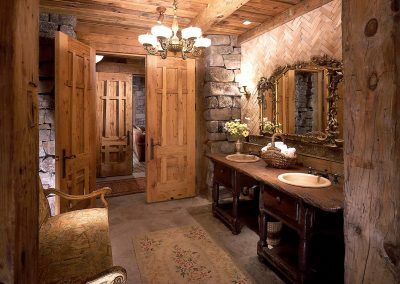 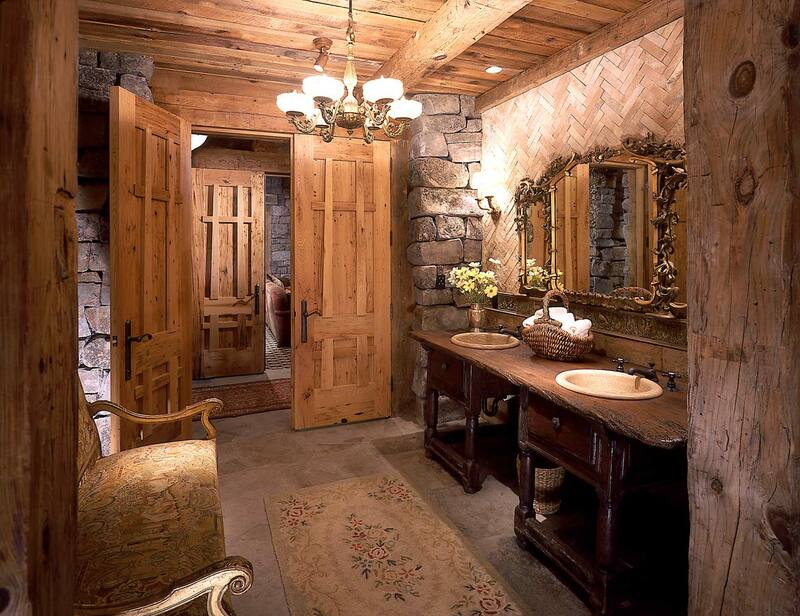 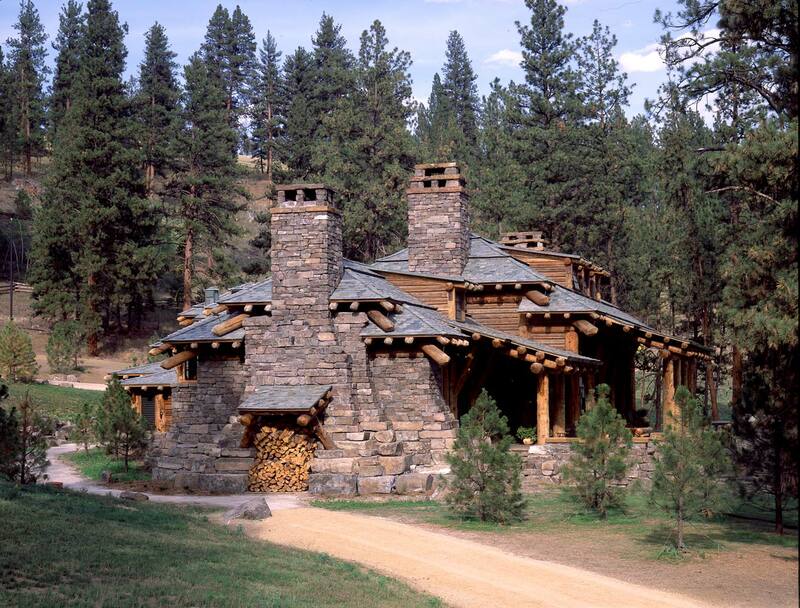 The structure is highly crafted with influences from the National Parks rustic style and the Arts & Crafts movement. 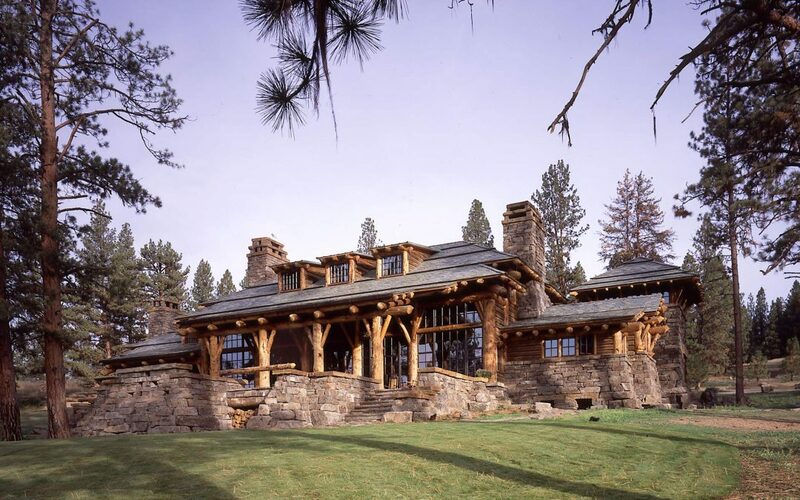 The design has a dual personality— heavy and fortress like with indigenous moss rock splayed walls and small windows on the north side to shed the snow build up, and major full height glass windows extending onto verandas for solar gain, natural light and views on the south side. 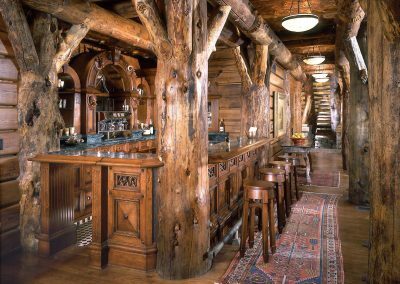 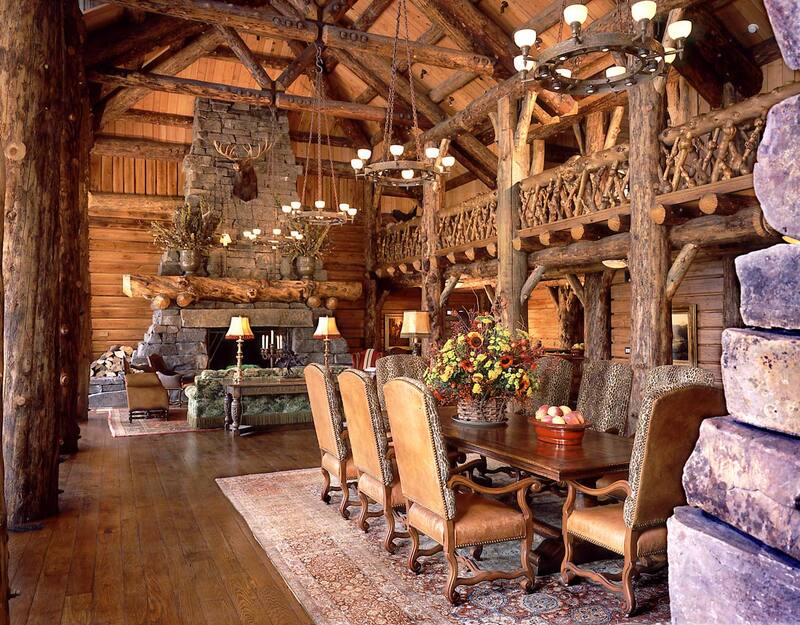 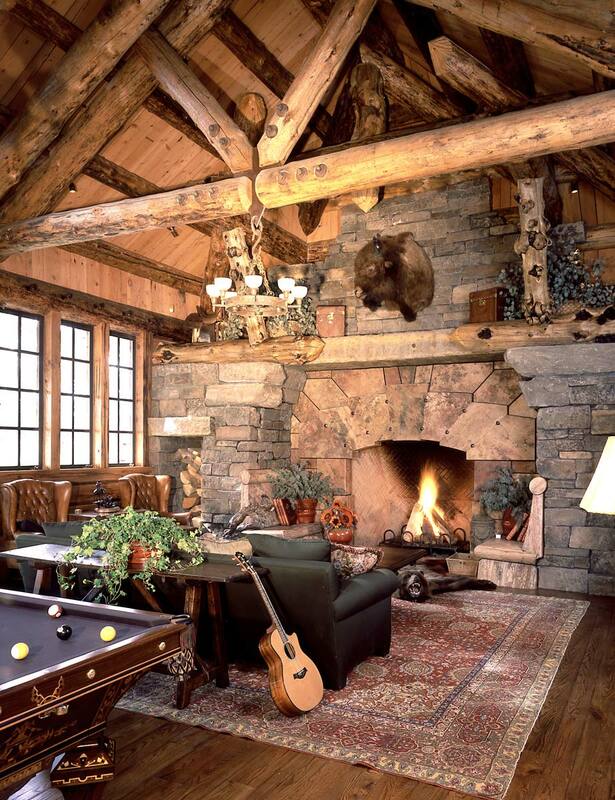 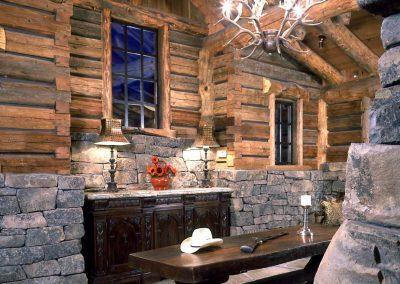 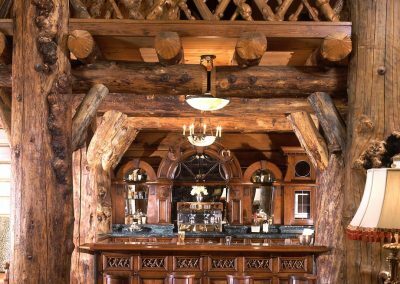 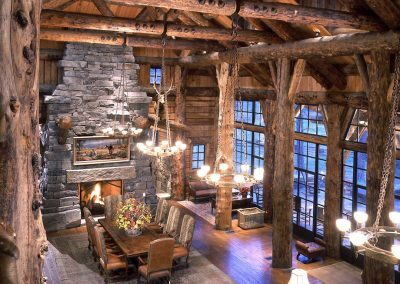 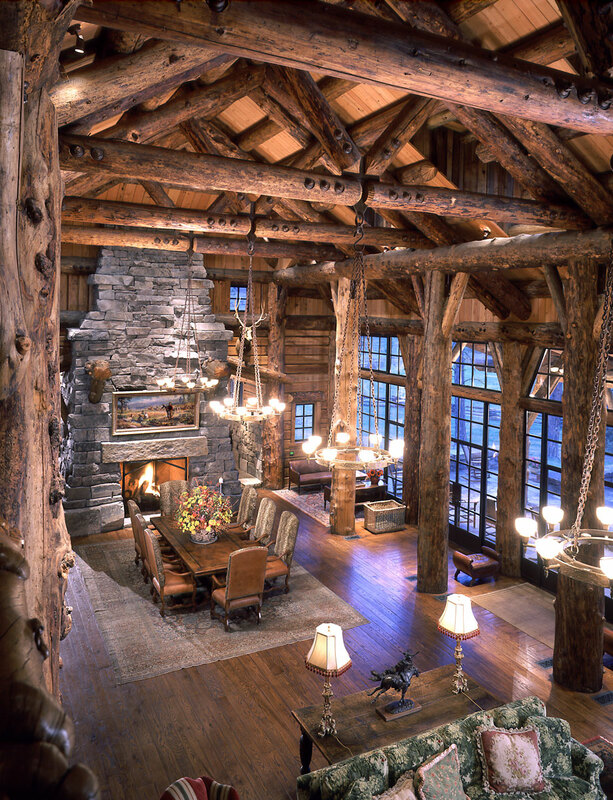 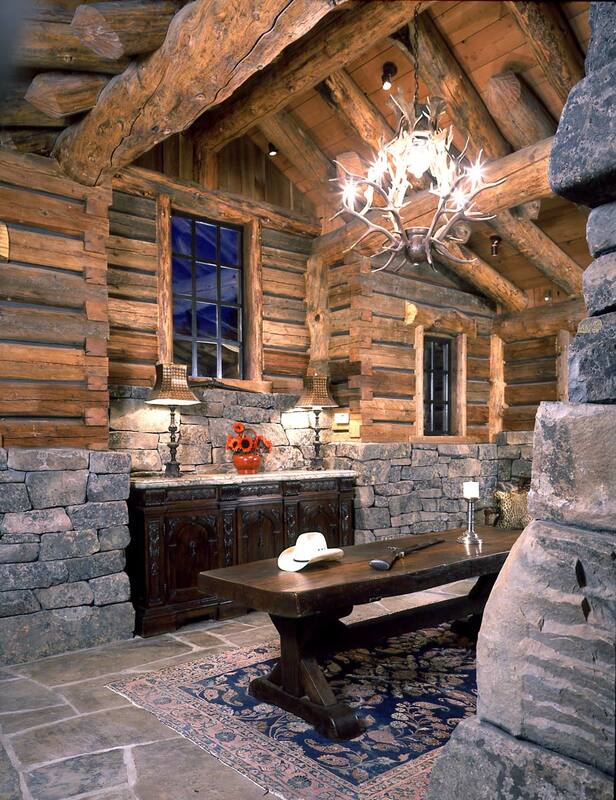 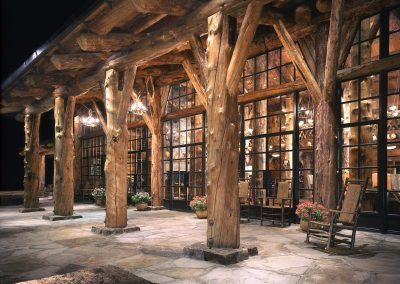 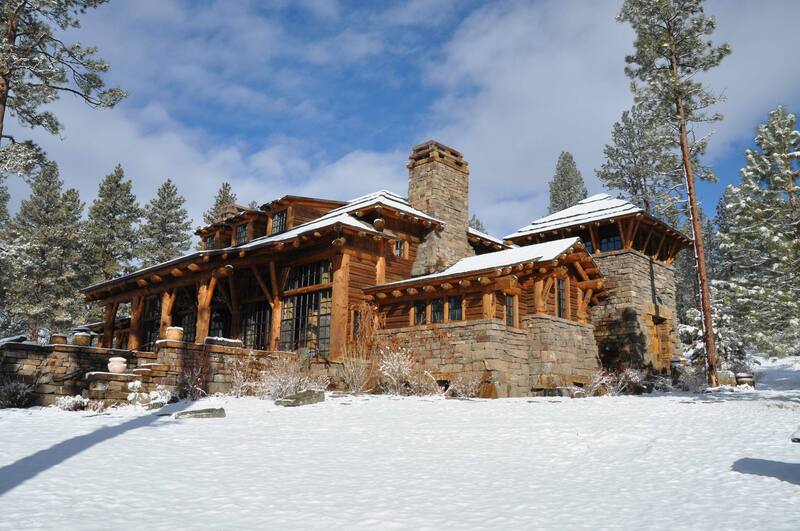 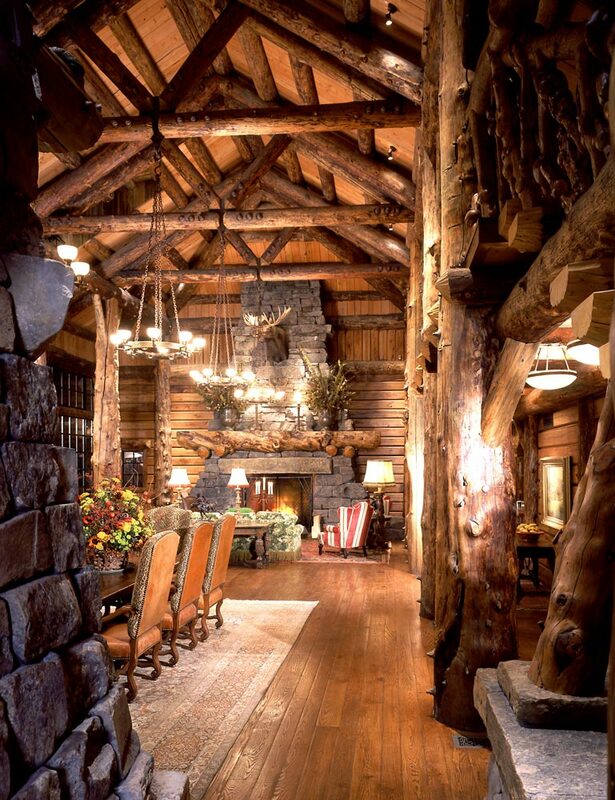 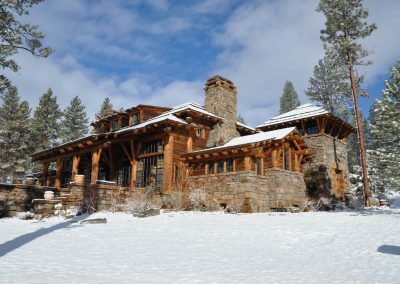 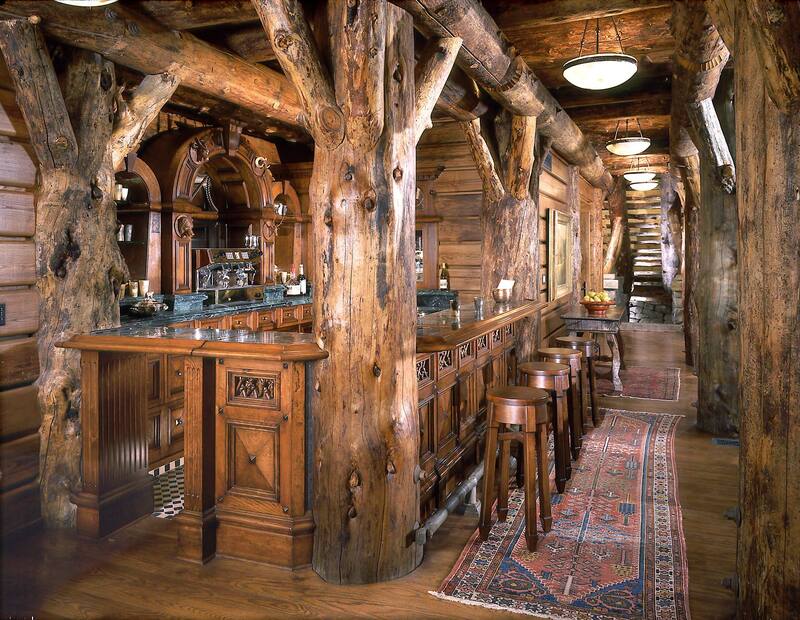 The lodge is constructed with “fire killed” logs of reclaimed lodge pole pine from the Yellowstone fires. 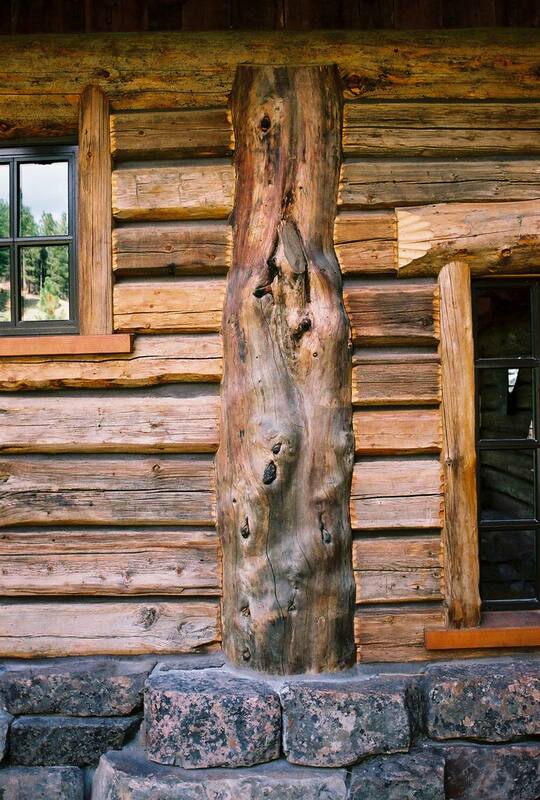 Double hips were created at the roofs, another unique feature not previously seen in other log structures. The reclaimed green slate roof is also unique. 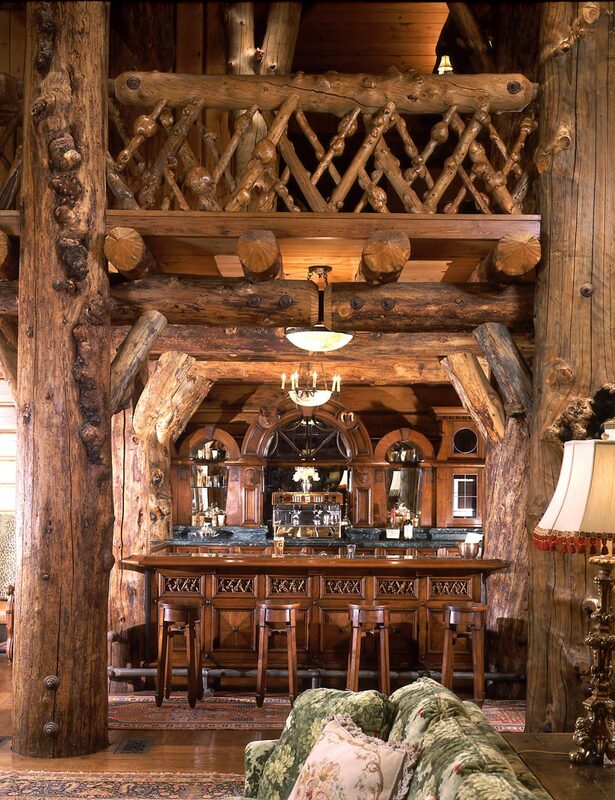 It steps up to the ridge in 3 or 4 tiers, each tier using smaller sizes of slate, thus creating a forced perspective to blend into the tree canopy. 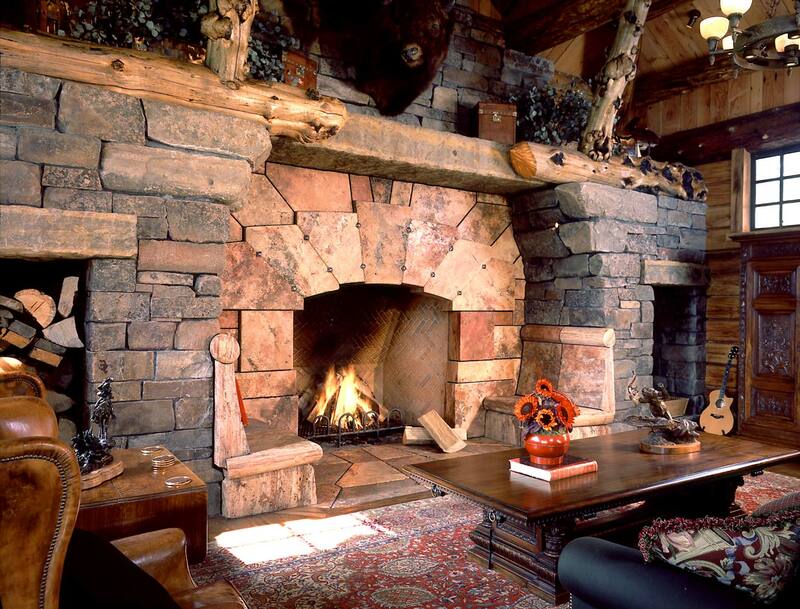 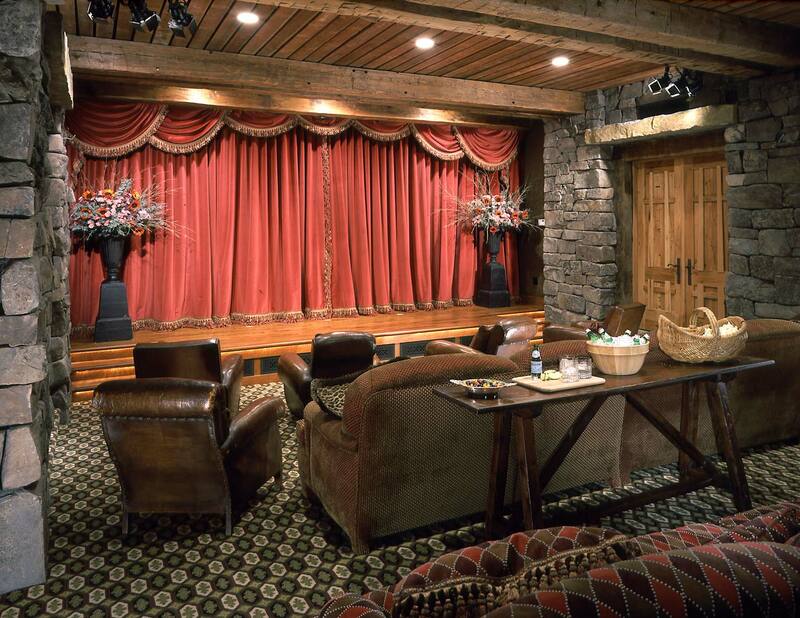 Indigenous Montana moss rock from the site is used for the tapered stone walls. 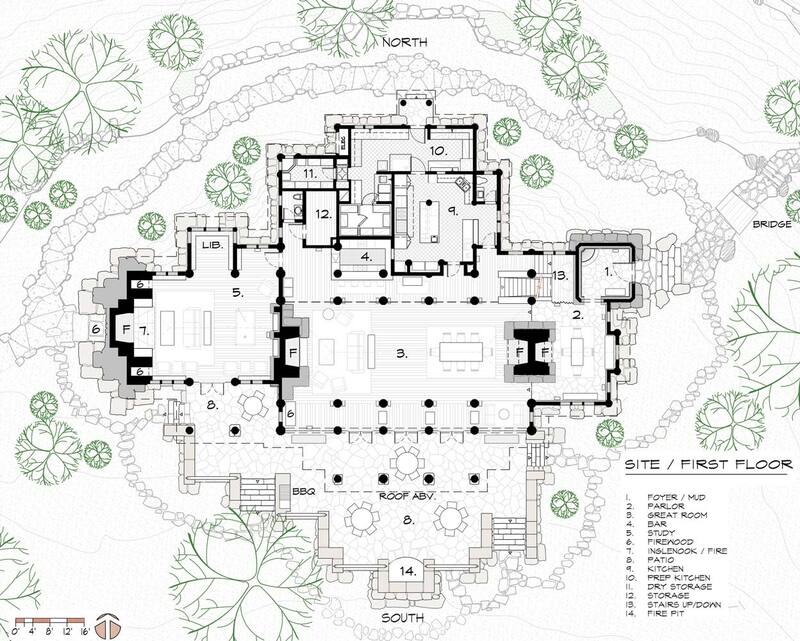 There was no grading on this project. 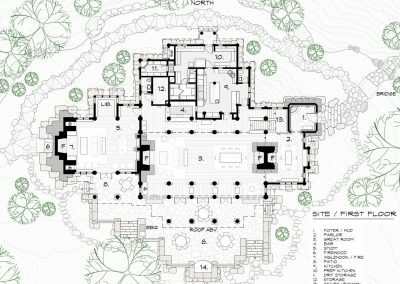 Ewing led over 17 groups of interested architects and builders, explaining the design and construction sequencing process during the last year of construction. 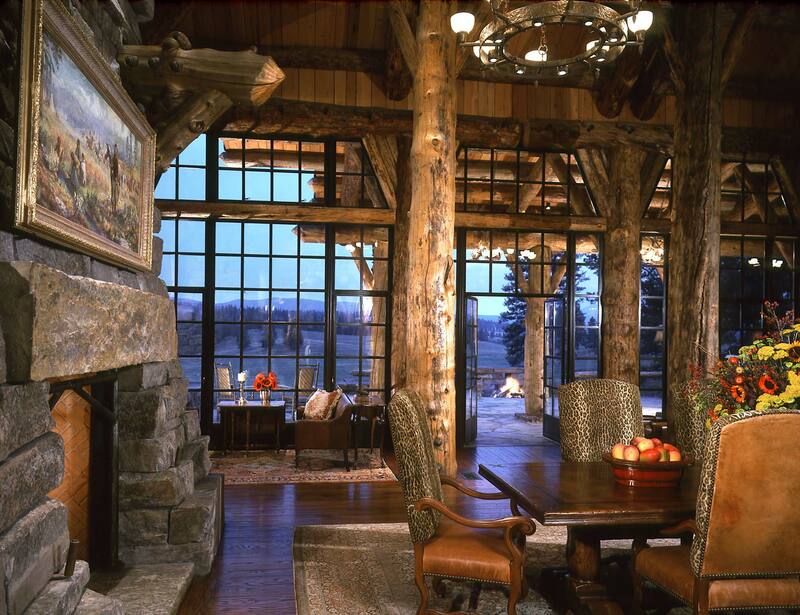 SIGNIFICANCE: Innovative design technologies, engineering detailing and a log flying buttress lateral system created for this project allowed for large glass openings between cantilevered log columns, eliminating the need for standard shear walls and steel reinforcement. 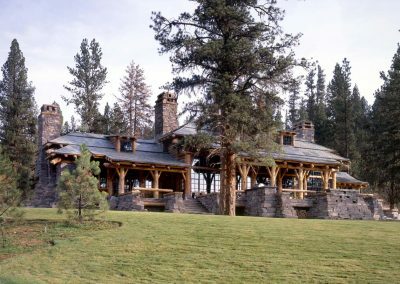 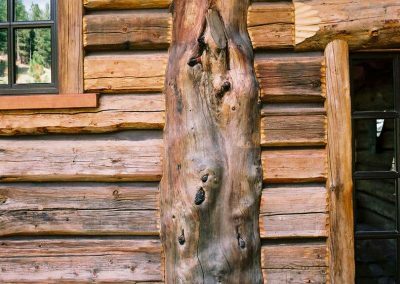 This new building methodology has promoted higher standards for the design, craft and technology in log construction in Montana and other regions.